Electoral district? Representative democracy? What's that? I'm from Janesmander ahh ...Gerryville ...uh ...I mean, Janesville. With the installation of three new council members and one incumbent now complete, nothing has changed regarding the absence of district representation on the city council. In short, the people of Janesville have been gerrymandered out of power since 1923. Talk about being stuck in a time capsule. To be fair to those newly elected, bringing representative democracy to Janesville cannot be accomplished under the current system. Instead, it would require a referendum to repeal the city's current "at-large" council/manager government including top-to-bottom structural reform of the city's by-laws and administrative procedures. However, none of that is about to happen anytime soon. Oddly, and for reasons I can't explain, it seems a majority in Janesville really like to be powerless and with no voice in city hall. So, with the "new" seven member Janesville city council seated, it turns out that without the one council member hailing from the city's south side, Jens Jorgensen, there would be NOBODY serving on the council west of Randall Avenue. When you consider the population density west of Randall and west (and south) of the Rock River, that's more than half of the city. Think about that. If you're from Janesville and care about the city - that should be an outrage. And, as I bang away on my keyboard, Jorgensen has been targeted by the city's right-wing engineers and administration power strokers. He is under constant personal attack from the Gazette's drive-by media tools. To top it off, Janesville's so-called democratic majority and whatever remains of its "progressive" community have been completely absent on Janesville's dismembered democracy over the last ten years. Through much careful analysis including a few wake-up calls, I'm now convinced they are responsible for propping it up every time it was on the verge of collapse. It is for those reasons that I now consider anyone from Janesville urgently complaining about or petitioning the state's gerrymandered legislative districts - a complete joke. Oh. 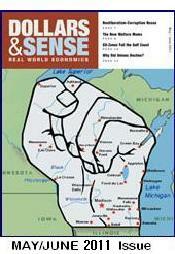 So you think the state's legislative districts are gerrymandered and need reform - and you're from Janesville?? I agree, concerning the issue of representation. However, regarding Janesville -- it's hard enough to get people to run at all. For the entire community. Hell, we can't even get reps for all the areas of the county! If forced to select from the meager pool of volunteers, if forced to organize them based on where they happen to live, we will often be stuck with people on the council who have NO business being on the council, simply because they're the only one who happens to live in a particular section of town. Until the days that a more diverse selection of council elect presents itself, perhaps it's better to continue as it has been. Besides. Nobody votes anyway. You made a good case for those who are content with the way things are. If people feel they are "forced" to run and serve and voters feel they are "forced" to elect people they don't want - then that too is a poor example of representative democracy. Then why bother with anything? But like almost everything else, conditions need to be improved with "incentives." Heck, Janesville has to offer businesses cash, tax kickbacks and free land just to come to our "great community." Yes, the comparison is apples and oranges, but people do respond to incentives. It's human nature. Yet we expect people to serve on the council under the most disincentivized demoralizingly anti-government compromised conditions? And then bash these folks over the head because they might be using it as a stepping stone to higher office? I don't agree that we would elect or could be stuck with people who have no business on the council. Diversity is a two way street. Representative democracy IS about electing people representative of a particular section of town. If people think they shouldn't be there, then run against them or encourage others to. Obviously, it's very easy to over-complicate this into rejection. But waiting for a more diverse council-elect to present itself before considering reform? I don't know where to begin.